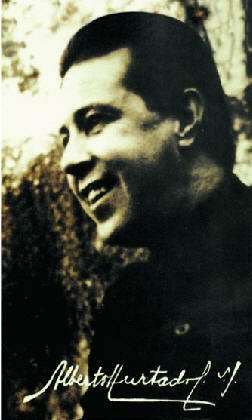 Born in Viña del Mar, Chile, on 22 January 1901, Saint Alberto Hurtado s.j. was a lawyer, social worker and writer of Basque origin as well as founder of the Hogar de Cristo foundation. He joined the Jesuits in 1923 and went to study in Cordoba, Argentina before going to Spain in 1927 to continue his studies. After the Spanish government closed down Jesuit order there, he continued his studies in Louvain, Belgium from 1931 to 1935. It was during this period in Belgium that young Fr Hurtado came under the influence of Joseph Cardijn. "Deeply marked by his theology studies at Louvain and notably by the personality and the thought of Cardinal Cardijn, the Chilean Jesuit Alberto Hurtado denounced both capitalism and communism in the search for a third 'social Christian' path," writes Fr Jaime Castellon s.j. In 1940, he was appointed diocesan director of the Catholic Action youth movement and the very next year, its national director (1941–1944). That same year, in 1941, he wrote a book Es Chile un país católico? - Is Chile a Catholic Country? According to Wikipedia, the book published statistics revealing a lack of priests assigned to the working class and rural populations, including detailing parishes that had 10,000 lay people assigned for one priest covering huge geographic areas. "In 1947, Hurtado entered the labour movement to give support to Chilean workers. Inspired by the social teaching of the Catholic Church, he set up the Chilean Trade Union Association, whose aim was to train union leaders in Christian values," Living Space writes. "To this end, he wrote the three books: Social Humanism (1947), The Christian Social Order (1947) and Trade Unions (1950). To spread the social teaching of the Church and help Christians reflect and act on the serious social problems faced by the country in 1951 he founded a periodical called Mensaje (Message). He himself published numerous articles and books on labour issues seen from the side of the Catholic faith. His attractive personality and consistently optimistic and joyful attitudes attracted people of all kinds – young and old, intellectuals and workers alike. In 1952, after being rushed to hospital in great pain, he was diagnosed with pancreatic cancer. His last days were monitored by the national press and, even before his death, he had become a national hero. True to his nature, he gracefully accepted the inevitable. He died in Santiago on 18 August 1952 just 51 years old." Alberto Hurtado was beatified on 16 October 1994 by Pope John Paul II and canonised by Pope Benedict XVI on 23 October 23, 2005. 'Profondément marqué par ses études de théologie à Louvain et notamment par la personnalité et la pensée du cardinal Cardijn, le jésuite chilien Alberto Hurtado (1901-1952) dénonça tant le capitalisme que le communisme, à la recherche d'une troisième voie "sociale-chrétienne". - Jaime Castellon s.j.